Grape seed oil is one of the most popular oils. It is because of its availability – you can buy this cold pressed oil in amlost every food shop, healthy and natural food shop and drug stores. It’s not expensive but versatile – it works well both in the kitchen and in the bathroom used for various care treatments. It can be applied to your body, hair and face. You might use it to make a compress for hands and dried feet. There are numerous possibilities. Today I present three sensational hair treatments using the hero of the article. 1. Grape oil for hair oiling. Apply the oil to slightly damp hair (you don’t have to wash it unless it’s weighed down with styling products). Wrap your head with a special foil hat and towel. Oils like warmth – it activates their valuable ingredients. After minimum one hour thoroughly wash your hair using SLS-free shampoo (without chemical detergents which used for a long time, cumulate in tissues and disturb natural processes of the organism). It would be ideal to leave the oil overnight and wash it away in the morning but we don’t always have time for such a treatment. In this case, one hour is perfectly fine. 2. Grape oil combined with your hair mask. Adding a few drops of the oil to your favourite mask will bring very good effects. It will nourish the hair and enhance performance of the mask. You leave this specific as long as indicated on your mask package. There’s no need to leave it overnight. 3. Applied to dry or damp hair ends – without rinsing. 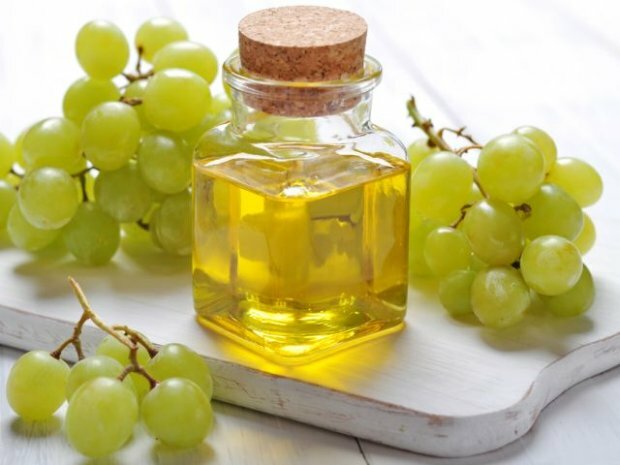 If your hair is very dry and hair ends suffer especially, grape seed oil will moisturize, nourish and discipline them. It will provide natural curl and emphasize natural beauty of your hair. Apply very small amount of the oil – 1-2 drops. Firstly, gently rub them in your hands to warm the oil up. Then, rub them into your hair ends (dry or wet). Now, enjoy moisturized and shiny hair. Finally, a few crucial facts about grape oil. What makes it such a good cosmetic? Most of all, it contains a very high concentration of fatty acids – valuable in cosmetics linoleic acid (omega-6) in particular. The acid regulates the work of sebaceous glands, accelerates any processes of hair and skin repair, prevents hair from breaking, moisturizes the cells. The oil is a perfect antioxidant because it contains previously mentioned linoleic acid, lecithin, resveratrols and flavonoids and various vitamins e.g. vitamin A,E,K,D. What’s more, it includes numerous minerals which nourish our hair and skin.